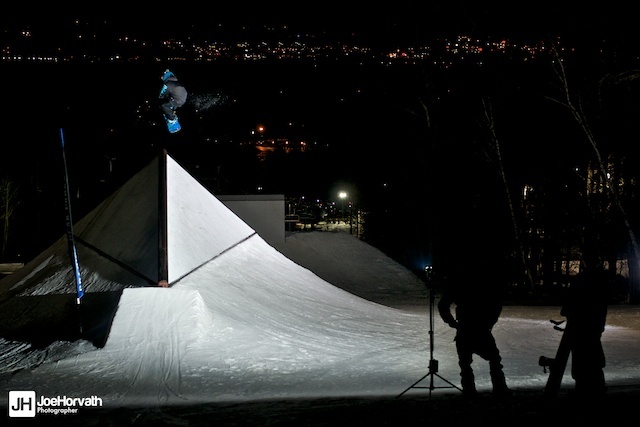 Finally got a chance to go back to Granite Peak and shoot some park features at night this past weekend. It took the better part of the day to get the plans finalized, but pretty much the whole Teamlab managed to make the trip up to Wausau for the second week in a row. For me it was actually the forth trip to Wausau in half as many weeks. Heavy driving schedule this time of year for sure. I stopped counting time in the car last week after adding up nearly 30 hours in 5 days. Makes me a little sick. Of course, the travel is to be expected. It has been a downright crappy winter here in the Midwest so it's been a mad rush when the conditions are good, and a waiting game when it is bad. Years like this make you appreciate the the good ones in the past. I haven't exactly shot a lot of park stuff this year. Normally, I would be out at Nordic Mountain several times a week, but I haven't been able to shoot there much this year. I have had a few chances to shoot in the Granite Peak Parks, and I must say that I am thoroughly impressed with the level of the features, riding, and the friendly staff. You can see a few shots of the lights I have been using above. I have been using a few different brackets to mount multiple lights on a single stand this year. Last year I used some Lumedyne DC flash packs, but this year it is small strobes only. I was pretty optimistic about this setup in the beginning, but it has caused numerous headaches with reliability and triggering in the cold. You can see here that I am using two pocket wizards, one for each light so at least one of the lights will trigger most of the time. The other light that you can't see is an old Vivitar 285 with a custom SLA battery pack. This is something that I have been working on for quite a while, and I think I have finally got it working the way I want it to. It's just a 6v external battery system, but it cuts the recharge time of the flash by about half when compared to AAs. I will write up a post about this flash battery soon, I have a few more features to add before I share it. But enough of that stuff, check out the photos. A few "almosts" and a few o.k. shots here, I sorted though like 400 shots to find these few. We spent a lot of time on the "shark fin" feature and then moved on to the wall ride later on. All of the guys hiked non-stop to make it happen and keep the shutter clicking. It was a pretty significant hike for each drop, but it was way quicker to hike than to ride the high speed 6 to the top after each run. Jory also did a bunch surf slashes on the fin during the session. It's sort of difficult to appreciate this trick just by looking at the photo. Jory actually floated a few of these above the front binding, it's a stupid hard coping-to-the-face fall if you go over the edge on this. Just sayin. More to come, check back soon. -J.H.